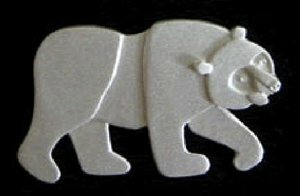 Sterling silver Brown Bear pin from Eric Carle's Brown Bear, Brown Bear, What Do You See? 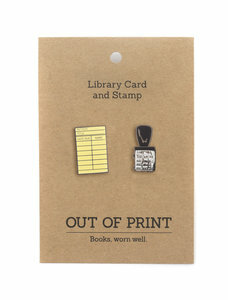 The perfect gift for book lovers and educators! Pin measures 2" wide by 1.5" tall and comes in a decorative Eric Carle gift box. Set of two enamel Elephant & Piggie pins perfect for fans of Mo Willems! Pins measure approximately 1". Set of 6 buttons featuring Eric Carle images and inspirational messages. 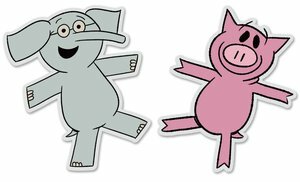 Great for party favors, classroom gifts or stocking stuffers! Can this puppy follow his nose--and his heart--to find where he belongs? Based on the book by New York Times bestselling author Kelly DiPucchio and illustrator Christian Robinson. White enamel with gold accents. Measures approximately 1.5" x 1". Limited edition. Looking for more Gaston goodness? Check out the plush and giclee prints! Sometimes making decisions is hard. Yes? No? Maybe? I don't know? 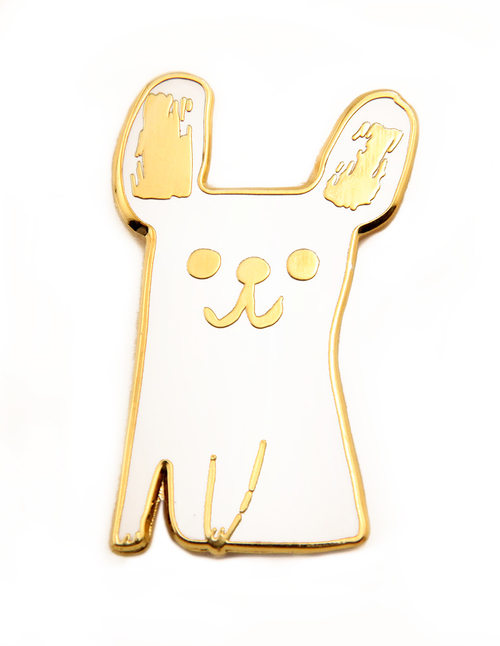 1" Gold hard enamel pin with white fill. Standard pin back with a black rubber clutch that won't slip off! 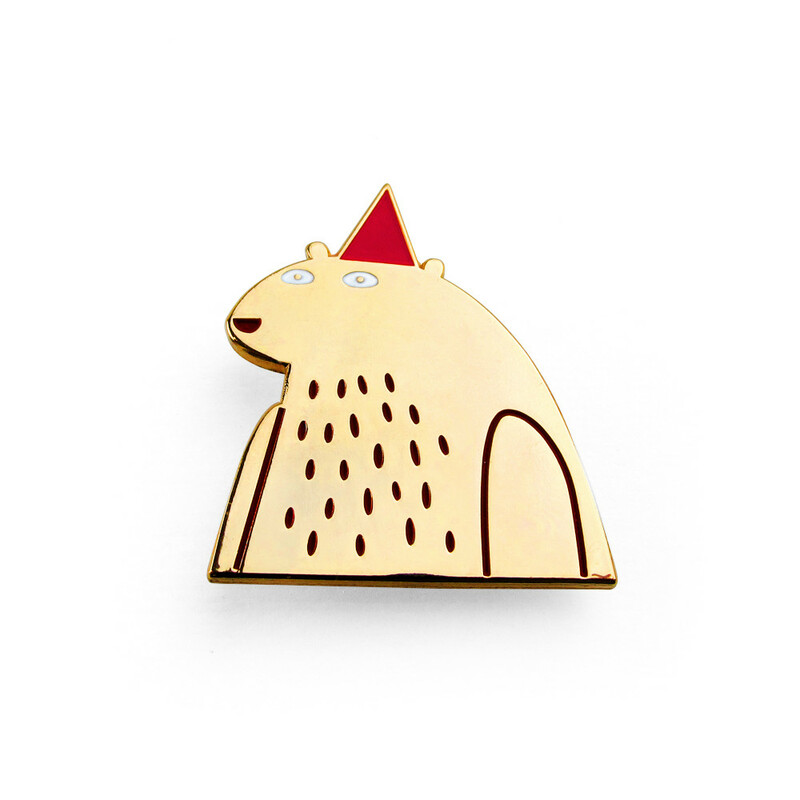 Limited edition, hard enamel gold pin designed by Jon Klassen, featuring the iconic bear from I Want My Hat Back. Measures approximately 1.5". 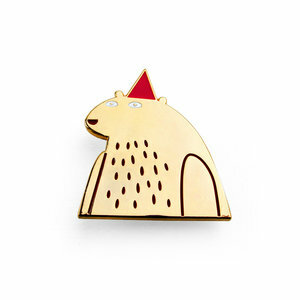 Pin is artistically dented for texture and layered with white enamel for the eyes and red for the hat . Features a metal clasp, and comes with decorative backing card. 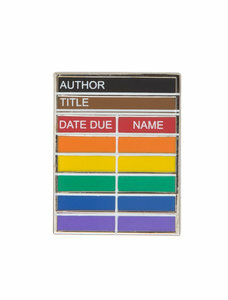 Pair it with the book for the pefect gift! 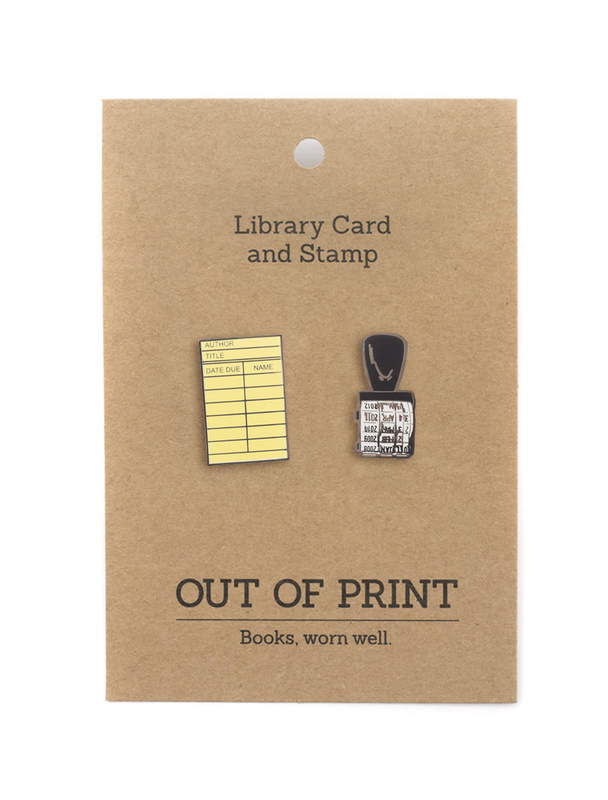 Set of two enamel pins perfect for librarians and all book lovers! Pins measure approximately 1". 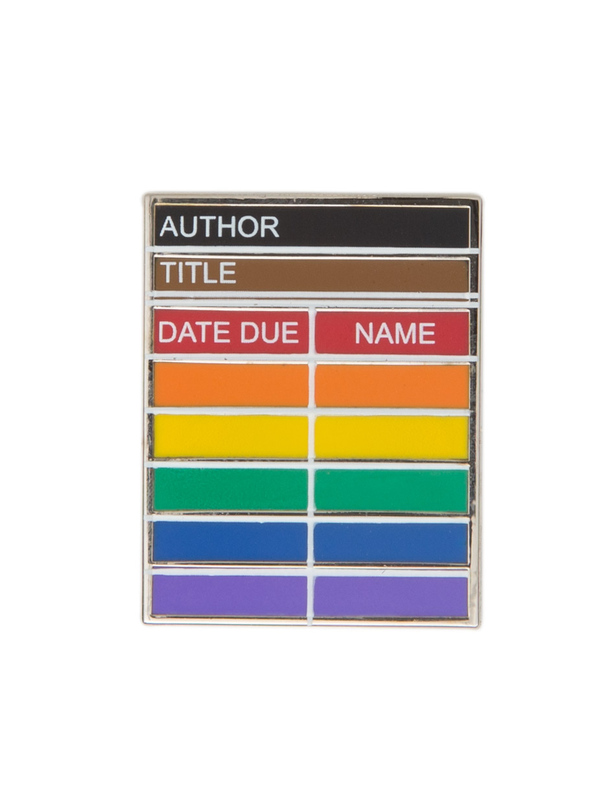 Show your pride with this library card enamel pin! Set of two enamel pins perfect for fans of The Little Prince! Pins measure approximately 1". A beautiful hard enamel pin badge featuring a simple and elegant, floral moth. Rose gold finish with black and white hard enamel. Measures approximately 1.25". Standard pin back with turquoise rubber, non-slip closure. 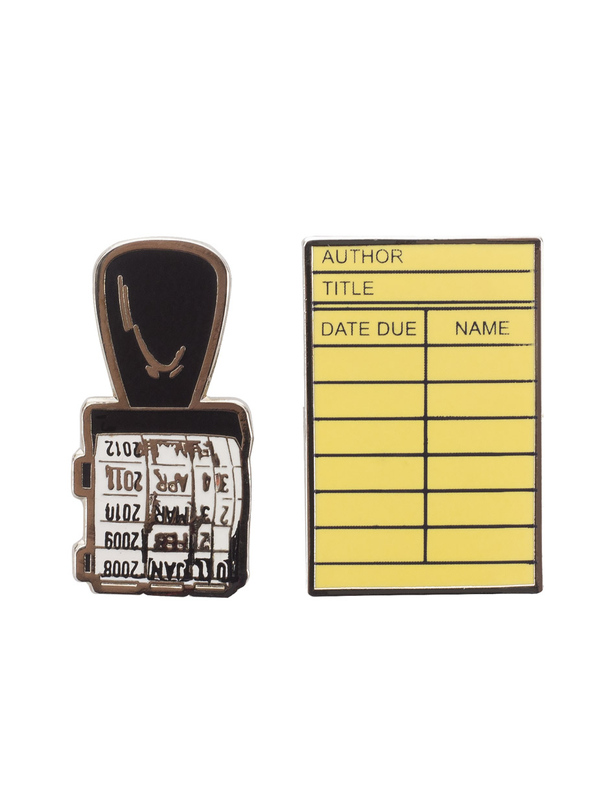 Set of two enamel pins perfect for the writer in your life. Pins measure approximately 1". Happy 16th Birthday to The Pigeon! "The Pigeon will be your best friend - if you have a bus and you let him drive it." A beautiful hard enamel pin badge featuring a simple and elegant, floral red panda. Set of two enamel pins perfect for the writer or coffee lover in your life. Pins measure approximately 1". 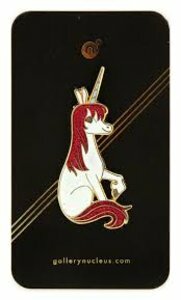 Glitter enamel Uni the Unicorn pin based on the artwork by Brigette Barrager. Measures approximately 2". 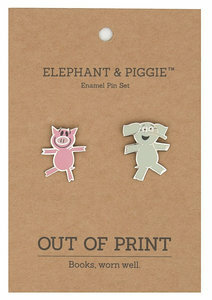 Set of two enamel pins perfect for fans of Eric Carle's The Very Hungry Caterpillar. Pins measure approximately 1". USA Exclusive! This Caterpillar pin has been imported exclusively for The Eric Carle Museum of Picture Book Art from Germany. One adorable enamel Very Hungry Caterpillar pin comes pinned to a colorful Eric Carle postcard. Makes a great gift for a favorite teacher! Pin measures approximately 1" long, making it the perfect size to attach to backpacks and clothing. For ages 3 and up. 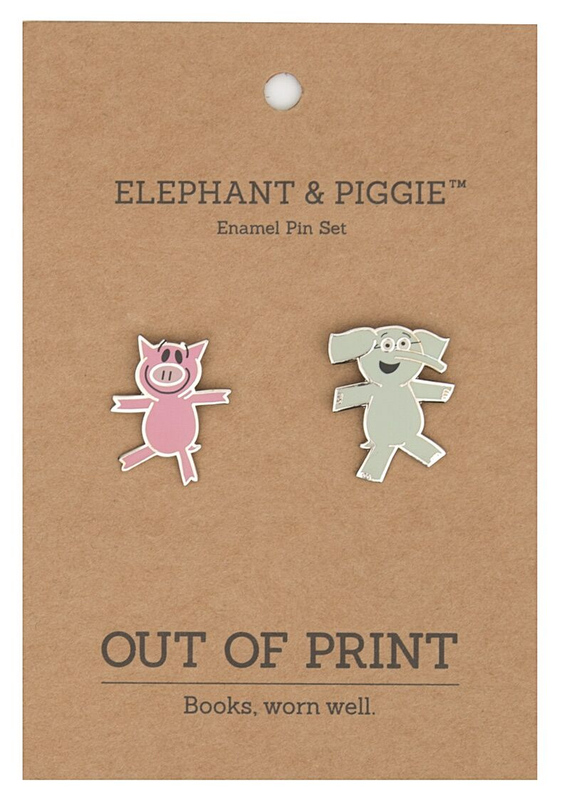 Set of two enamel pins perfect for fans of Maurice Sendak's Where the Wild Things Are. 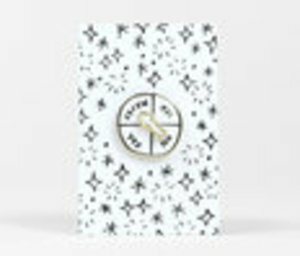 Pins measure approximately 1"
A reminder to try your best and to celebrate trying even when things don't work out the way you expected. 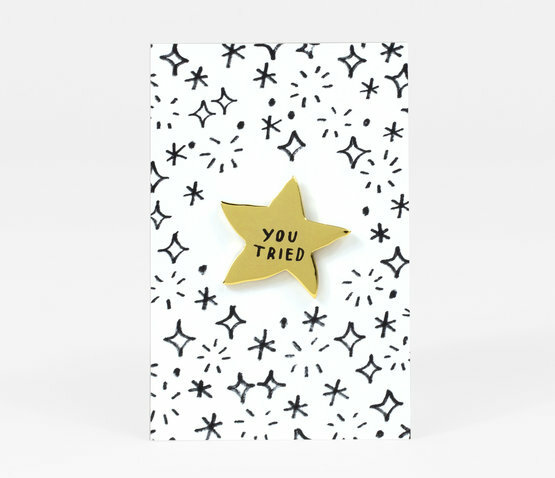 Here's a gold star. You deserve it. It's a little bit wonky, but hey, at least you tried. 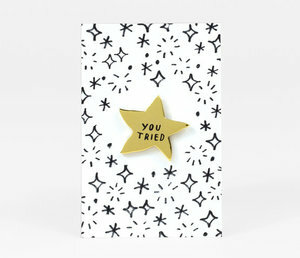 No one's perfect and this little gold star certainly isn't either! 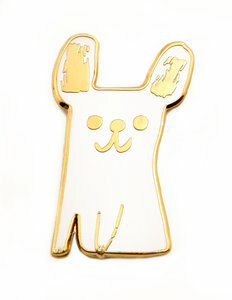 1" gold pin with black enamel fill. Standard pin back with non-slip black rubber clutch.